A unique problem associated with carrying a revolver is carrying spare ammunition capable of being quickly loaded into the revolver. A speedloader is best, but due to its width is a challenge to keep easily accessible while maintaining concealment. The JOX Speedloader Pouch might be the best answer to the problem. With revolvers intended for concealed carry, there are a few different ways to prepackage ammunition for reloading. The two most common are speed strips, usually what gets paired with smaller revolvers, and speed loaders. Speed loaders are faster than speed strips, but also difficult to carry because they are bulky. Carrying a speedloader in a pocket can be annoying because of how bulky they are. Since most speedloaders used these days are limited to competitive environments where concealment is not really a concern, many most speedloader pouches make no attempt to be even remotely concealable and focus on accessibility. The Safariland Split Six and the Desantis Second Six pouches are the only exceptions to that rule that I am aware of and are intended to carry spare speedloaders concealed. From a concealment perspective, these pouches work fine. Where they struggle is when you want to go fast, but still maintain the concealability because they both use flap closures to secure the speedloader. On the timer, I have not actually noticed that much difference between loading with a speedloader from the pocket, vs. from my Split Six pouch. The only real bonus to these flapped pouches is that I don’t have to carry the speedloader in a pocket. This is where the JOX speedloader pouch comes into play. It is an attempt to maintain concealability while not compromising speed, or at least not as much. The danger, of course, is trying to split the difference and not really doing either all that well. 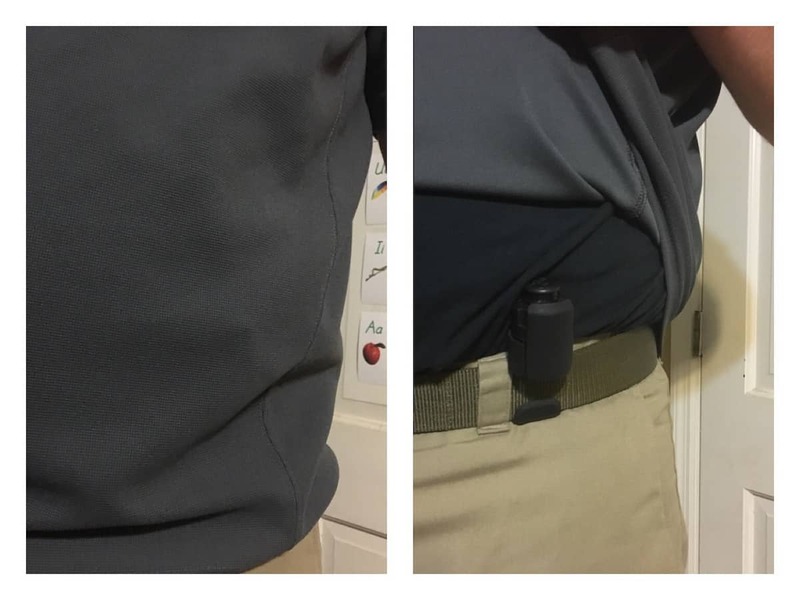 When I ordered the JOX Loader Pouch, I was surprised at the 7-8 week wait time for what seemed like a relatively small and straight forward piece of kydex gear. Nick Jacques, the guy behind the JOX, must stay busy. Nick’s communication also surprised me in a good way. His website sent an automated response to confirm the order. A day later that was followed up by a personal e-mail from Nick. After a couple of e-mails back and forth, I found out Nick is more than just a kydex guy, he is a revolver guy. Perhaps a good sign for the conceptual quality of the gear because sometimes it takes personal experience carrying a revolver to have the correct perspective to build something to meet such a specific need for the shooter. Eight weeks after ordering, the JOX speedloader pouch arrived on my porch, nicely packaged in a sturdy box, which I always like to see. The pouch comes with directions on how to put it on, and some recommendations for how to best use it. The pouch attaches to the belt via a reverse J-hook sort of set up. It has a very low profile but is also very secure. It also includes three small foam inserts to adjust the seating depth of the speedloader when in the pouch. I typically run a 158gr .38 Special load which matches the OAL of my Speer 135gr .357 Magnum Gold Dots that I use as a carry load and did not require the foam spacers. That will vary though based on the load being carried in the speedloader. I had ordered the pouch with unpolished edges, and quite honestly I don’t think polished edges would make that much of a difference, even aesthetically. The build quality on the pouch is top notch. The design itself is ingenious and the construction is precise as well. This is professional grade kydex wizardry, no doubt. On the speed matter, no question, the JOX is faster than a pouch with a flap to secure the loader. It is also much less fumble prone, which is an issue I have had when running the Split Six pouch. On concealment, I will also say yes, but with a caveat. I can only provide feedback on how the JOX interfaces with my own carry setup and body type. I personally did not have trouble concealing the JOX pouch. But I am a big guy at 6’4”, and typically wear an untucked button-up shirt or a polo shirt. In my particular case, it is comparable to concealing a spare magazine for a semi-auto pistol. Access to the speedloader is much improved. And the loader is secure enough in the pouch that it would be very unlikely to come out. The pouch itself also secures to the belt very well. It is possible to slide the pouch forward and back on the belt. So that is something to be aware of. I carried the pouch at about the 10 o’clock position and did not have issues with it moving around. But other carry positions may yield different results. The one downside to this pouch is the cost. It is a touch over $50 for a single pouch with shipping, over twice what a Split Six pouch will cost, and about 1.5 times what the Desantis Second Six retails for. 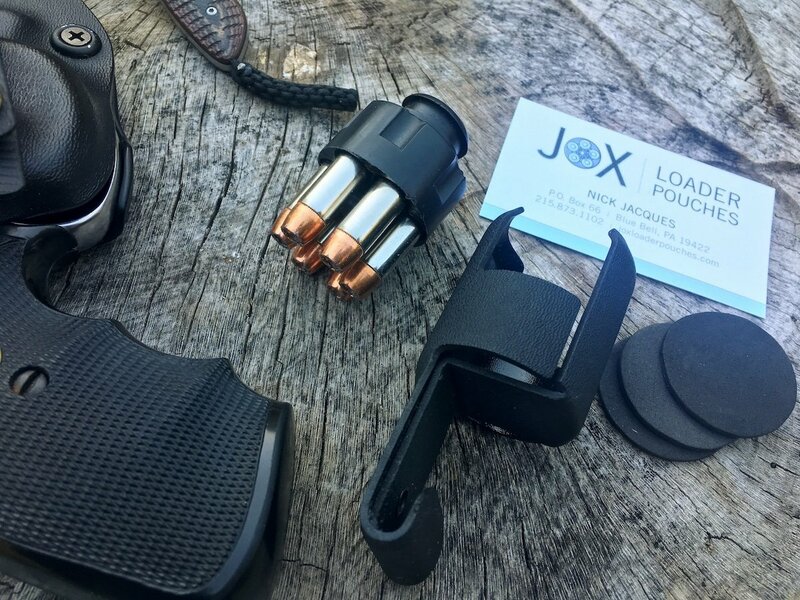 I think the JOX pouch is probably the best currently available in terms of balancing concealment and access to the loader, but it certainly comes at a price. So I guess the question is, would I buy it again, or buy another one? Yes, I would. In fact, I am going to. While perhaps not the cheapest, I think in many ways this is the best currently available. Especially when it comes to balancing concealment and the ability to reload the revolver quickly.